Waldenburg (Germany), 23 January 2019 – Continuous double-digit growth and most favorable prospects for the future were essential for the expansion of Würth Elektronik eiSos. The manufacturer of electronic and electromechanical components has founded a subsidiary in Slovenia. In Trbovlje, 60 km east of Ljubljana, nine employees serve the Slovenian market and a growing number of customers in Croatia and Serbia. The managing director of the new Würth Elektronik eiSos subsidiary is Matjaž Popotnik who, as the first sales representative, has grown business for Würth Elektronik eiSos in Slovenia since 2012. The team in Slovenia supports local electronics developers with technical solutions, free samples and high availability of components. 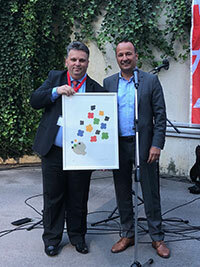 After opening a subsidiary in Israel in 2018, Slovenia is the second spin-off from the Würth Elektronik eiSos Group within a short period. This clearly illustrates the increasingly international focus of Würth Elektronik eiSos and the success the company has in the process. Thomas Schrott, CEO, and Matjaž Popotnik, managing director of the new Würth Elektronik eiSos subsidiary (both Würth Elektronik eiSos), while handing over a present from Gaisbach.